Fall is here and we are having a blast celebrating autumn and Halloween. This year Sophia is Ming Ming (the duck) from the Wonder Pets. Sophia loves the Wonder Pets and when we saw a duck costume in Target a few months ago we could not resist. I made Ming Ming's cape out of felt and it looks great. At first Sophia protested about getting in her costume but sure enough she humored me and Grandma Bev on Friday night. 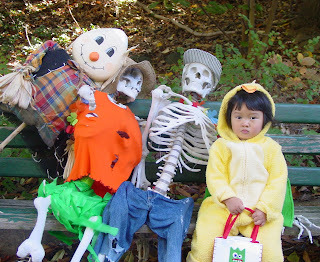 We also took her to Boo at the Zoo on Sunday since I teach on Halloween night so I will miss all the fun. Sophia makes a wonderful Ming Ming.